Approximately 1.5 hours north of Ottawa, a recording studio sits amongst nature. Jordon Zadorozny, successful musician, brought his craft to the secluded area in hopes to be the ‘silent member’ of creators looking to hone their craft. To musicians, it’s like a religious experience. A church of trees, if you will. Bernard Frazer has been working on and off in the music industry for quite some time. While working on a project for Australia’s 66 Music, he was itching to start on something completely different. He had some songs in mind as he was piecing ideas together and knew he wanted a female voice that was fresh and out of his comfort zone. During Frazer's search for a female vocalist, Felicity DeCarle came across one of his ads on Facebook. DeCarle's background is equally inconsistent when it comes to being in the industry. Despite slowing down her career while attending university, this opportunity came along at the right time. It started with a cover of Britney Spears’ “Baby One More Time” for a 66 Music project. After nailing that performance, Frazer introduced DeCarle to a number of tracks that he had yet to finish. “I really wanted to see what she would bring to the table because one of the great things about collaboration is if you find the right person, they bring things to the table that you never would have thought of,” Frazer said. 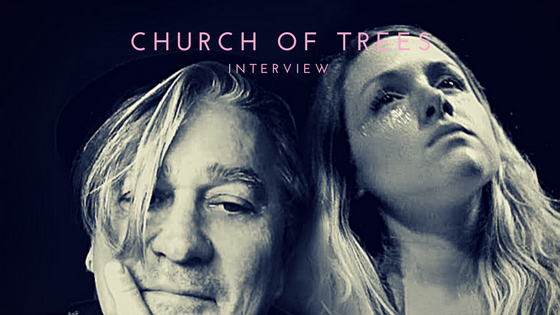 The first track he sent was a song called “Primitive Creatures” and would ultimately become the name and title track of their first EP as Church of Trees. The EP combines both of their musical influences – Bowie for Frazer and Grimes for DeCarle – into a synth-pop sound that has a fantastical quality. With the lyrics Frazer gave, DeCarle sent back a refreshing take on his ideas. There really was something magical happening. Thousands of acres of pristine forest surround Frazer and DeCarle's living spaces in Ottawa, Canada. The seclusion creates solitude and peace that not only surrounds them but inspires them. It really is a church of trees.